This area comprises of the valleys of 2 chalk streams – the Wye and the Misbourne. The Wye Valley connects the Upper Hughenden Valley, Radnage Valley and Gomm Valley BOAs while the Misbourne connects to the Colne Valley. Landscape Types: The Misbourne flows through a wooded agricultural landscape until it’s lower reaches where it has an unwooded wetland landscape, The Wye Valley is predominantly urban until south of Loudwater where it is wooded agricultural. Geology: Chalk except for the final reaches of the Misbourne which is mudstone. There is alluvium on the valley bottoms and wider sands and gravels on the lower reaches of both. Topography: Valleys with steep slopes with protruding spurs and a strong convex profile to the upper slopes. The valley bottoms are gently sloping with little flood plain. 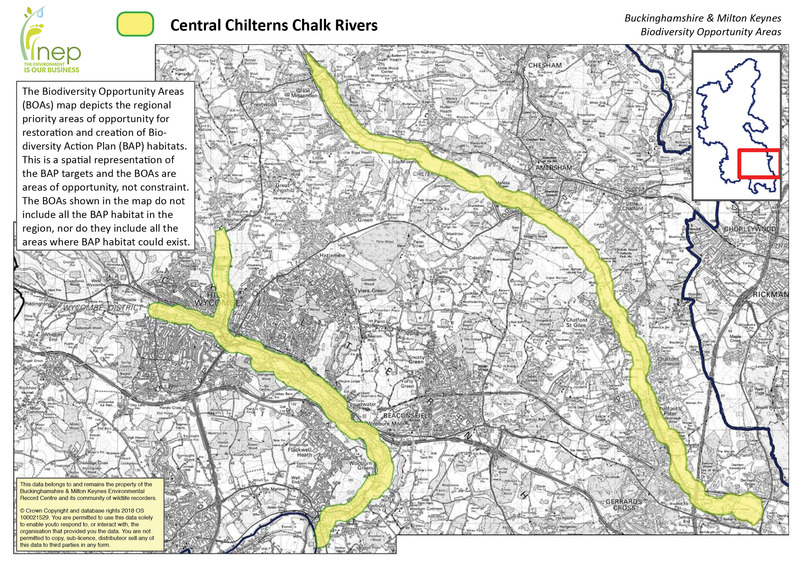 Rivers / Streams – Both the Misbourne and Wye are chalk streams and are a priority in the UK Rivers and Streams HAP. Lowland Meadows – There are lowland meadows at Old Rectory Meadows SSSI in the Misbourne Valley. Lakes – Shardeloes Lake in Misbourne Valley. Woodland – There are 2 woodland LWSs in the Wye Valley. Traditional Orchards – There are potential BAP orchards in both valleys. Wood Pasture & Parkland – There are potential parklands in both valleys – Misbourne Valley; Missenden Abbey, Shardeloes, Denham Place and Wye Valley; West Wycombe Hughenden Manor, Wycombe Abbey. Hedgerows – Some areas of the Misbourne Valley contain pre-18th century enclosures which may contain species rich hedgerows. There are historic parks and gardens in both valleys – Misbourne Valley –Missenden Abbey, Shardeloes, Denham Place and Wye Valley – West Wycombe, Hughenden Manor, Wycombe Abbey.